This article is about the projectile weapon found in multiple platformers, typically as an obstacle. For the minigame in Mario Party: Island Tour, see Cannonball!. Cannonballs are heavy metal spheres that are launched from cannons. Mario and Luigi are able to stop the lethal shots by stomping on them in mid-air; they can also be dodged relatively easily. They appear most prominently in Super Mario Bros. 3 where they are fired from cannons mounted on Bowser's tanks, boats, and airships. Cannonballs reappear in Super Mario Galaxy with a renewed appearance. They sport a white line around their center and two yellow circles on opposite sides. 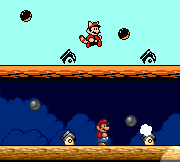 In this game, cannonballs are fired by cannons located in Battlerock Galaxy and Dreadnought Galaxy, as well as from airships in Bowser Jr.'s Airship Armada. One notable difference with these cannonballs is that rather than simply colliding with the hero they explode upon impact. This will knock Mario down and may also result in him being thrown off a platform or into a black hole. To attack a cannonball, the player must jump on it or shoot it with a Star Bit. The first three cannonballs originating from the same cannon to be destroyed this way produce a coin each. Cannonballs make another return in New Super Mario Bros. Wii, in which they only appear in World 8's airship. The giant cannonballs also return from Super Mario Bros. 3. Since the cannons are always found in a group, there is a high chance for the player to earn endless 1-Ups by jumping on each cannonball consecutively without touching the ground. Cannonballs make a reappearance in Super Mario Galaxy 2, retaining their function from the predecessor, though they only appear in Bowser Jr.'s Fearsome Fleet. Cannonballs also appear in the Wii U title, New Super Mario Bros. U, where they act just like the ones in the predecessors. They can only be found in The Mighty Cannonship, from Soda Jungle. There is also a Challenge called Airship 1-Up Rally, which consists of jumping on many Cannonballs without falling to receive many 1-Ups. Cannonballs don't reappear in New Super Luigi U.
Cannonballs appear again in Super Mario 3D World, in which they are fired out of cannons and Cannon Boxes. 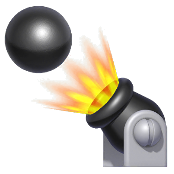 Cannonballs reappear in Super Mario Maker and Super Mario Maker for Nintendo 3DS, where they are from cannons. Shaking a cannon will make it produce red cannonballs, which are much faster than normal ones. When a Mushroom is dragged onto a cannon, it will shoot Giant Cannonballs. Cannonballs occasionally appear in several episodes of The Adventures of Super Mario Bros. 3. In the game Mario is Missing!, Luigi has to return the cannonball of the Emperor's Cannon to the Kremlin. It had been stolen by Koopa Troopas. Cannonballs appear again in Mario & Luigi: Superstar Saga, where they are fired at the Mario brothers by Gunner Guys in battle. 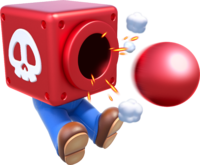 In Wario World, Captain Skull shoots gigantic, white cannonballs with human-like faces on them, which explode upon impact. Cannonballs are shot by Bowser Jr. in his standard special move in Super Smash Bros. for Nintendo 3DS / Wii U and Super Smash Bros. Ultimate, Clown Cannon. Cannonballs appear in Paper Mario: Color Splash, where they are fired from the Toad Captain's ship. When Shy Guys take over the ship, they fire the cannonballs randomly, narrowly missing Huey. Mario can use the cannonballs to hit targets and collect coins in the Violet Passage. Notebook bio: "A projectile fired from a cannon, it travels slowly in the air. Its smooth surface can easily be stepped on." In Mario vs. Donkey Kong, Mario will not get struck by a cannonball if he makes contact with one during certain frames of the backflip animation. This page was last edited on January 12, 2019, at 15:26.